Lichens are some of the most amazing living things on this planet. Often the first form of life to colonize a new area of rock they occur all across the known world. Lichens are commonly seen and also commonly overlooked. Any structure that has been standing for a reasonable amount of time is likely to be adorned with lichens. Particularly, they are common on older buildings, stone walls, in graveyards and on most perennial (living more than 2 years) plants, particularly trees. 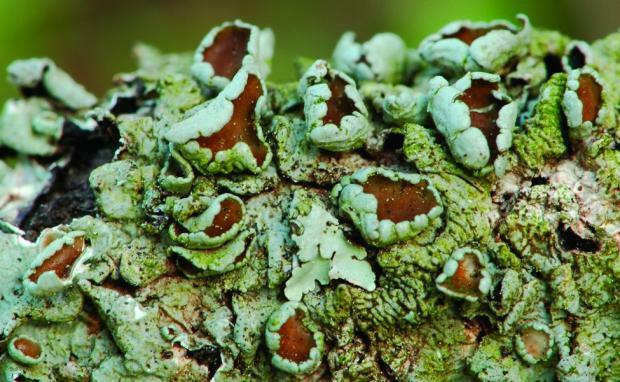 Lichens are amazing living entities, in that they are not a single organism like plants, animals or fungi. Instead every single lichen is the result of two or more separate organisms living permanently together. A lichen is a symbiosis. That means that it is two or more organisms living together such that both are more successful within the partnership than they would have been if they were living on their own. All lichens are made up of a fungal partner and either/or an algal partner or a cyanobacterium partner, or both. With lichens the basic components of this partnership are 1) a fungus called the 'mycobiont' and 2) one or more algae and/or a cyanobacteria called the 'photobiont'. Lichens first appeared about 400 million years ago so they have been around for a long time. Some individual species such as Hypogymnia physodes have been around for at least 25 million years and maybe for as long as 70 million years. Obviously the lichen symbiosis is a successful strategy. Lichens are scientifically fascinating, the symbiosis mentioned above is intriguing to many people and has been much studied, although it is not yet fully understood. Lichens are also of great use to ecologists. Many lichens show a remarkable sensitivity to air quality. Some forms growing almost anywhere, others living in only the purist of atmospheres. For many ecologists lichens are an accurate monitor of quality of the air in any given place. Lichens are used by scientists not only in the study of the lichens' own life cycles, but also as indicators of pollution and mineral content on rocks. Lichens store numerous minerals in their thalli, their presence and concentration is indicative of the composition of the rock that they are growing on. Lichens are some of the most amazing living things on this planet.